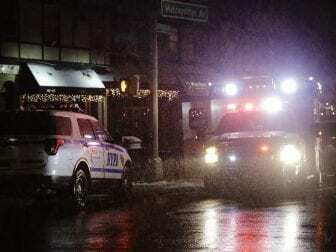 Two lawmakers in New York City have issued a siren call of sorts, arguing that the shrill sound of police cars, fire trucks and ambulances has got to go. Emergency vehicles in the Queens borough of New York on Feb. 20. The shrill drone of the sirens lies at the center of a bill by two city lawmakers to transition to new siren sounds. If passed, the legislation would require all emergency vehicles to change their sirens within two years to an alternating high and low sound similar to that heard in many European countries. Council Member Helen Rosenthal introduced the legislation on Feb. 13. Carlina Rivera, who co-sponsored the bill, says the noise pollution in New York’s five boroughs can cause cardiovascular disease, cognitive impairment and hypertension. “Emergency sirens are clearly important in alerting people to nearby emergency vehicles that need to quickly navigate the crowded streets of New York,” Rivera said. But she says a less traditional sound could still do the job in the city that never sleeps. Their legislation takes a cue from a Mount Sinai Hospital pilot project. After ambulances lowered the tone of their sirens and used a two-tone, high-low pattern, Rosenthal says complaints among locals dropped. According to The Associated Press, the European-inspired siren, which rings in at 118 decibels, is not any less loud than New York sirens, but it does have a lower frequency that sounds less piercing. Noise pollution is not just a concern in cities: A 2017 study by researchers from Colorado State University found that in more than 20 percent of the protected areas they studied, unnatural sounds were 10 times as loud as the natural background. A hearing for the siren measure and discussions on the logistical challenges of implementing it have yet to scheduled, Rosenthal’s spokesperson Sarah Crean tells NPR. “It’s too early to say whether the bill will pass for sure but there certainly has been a lot of interest in it,” Crean says.